Nothing induces a world-weary sigh from working professionals like a “just checking in” email. They’re the bane of our inbox existence. Here are a few ways to make sure your follow-up incites action, not apathy. What’s the problem with “just checking in” emails? As a writer for a popular blog (this one) and a freelance PR professional, I get follow-up emails on the regular. They come in for different reasons, from different sources, but they all have something in common—the person sending them wants something. 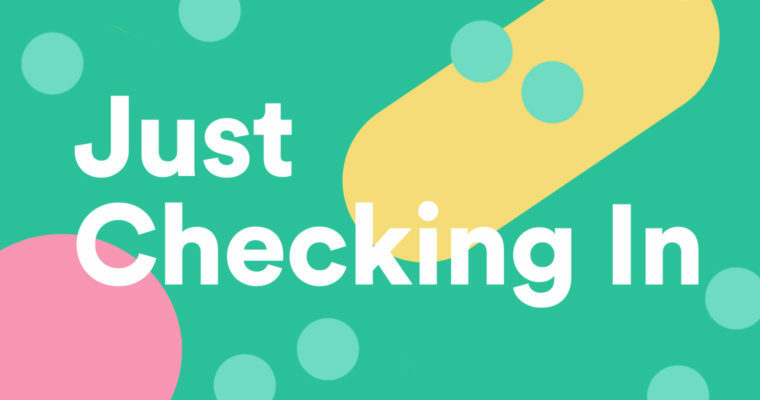 The problem with “just checking in” is that it’s a smokescreen we all instantly see through. A check-in is an indirect request for our time or attention, and we find ourselves wishing the sender had gotten straight to the point. Wouldn’t it be nice if there was a one-size-fits-all alternative to “just checking in?” Unfortunately, variations on that phrase (like “I’m following up on . . .”) all spark the same visceral response. We prefer a more straightforward approach. When it’s time to follow up, It’s not a new phrase you need but an entirely new strategy. Here are a few unique ways to follow up without making your tune out. Sometimes you need to know where a project or task stands. Although this is a perfectly good reason to check in via email, there are ways to avoid the “just checking in” language we all dread. Drop the “checking in” wind-up and ask for an update politely and directly. Use the request for a status update as a call-to-action, and make it time sensitive so you’re more likely to get a response. I’d love to hear how things are going with the Great Big Infographic design brief. Could you give me a quick status update by end-of-day? If you’re concerned that a task may have fallen through the cracks, start with a little context. It can be helpful to explain why the task is important to you, too. Last Friday, we talked about growth strategies over lunch, and you shared some thoughts. You offered to put together a list of project ideas for further brainstorming. I’ve been excited to get your input. Have you had a moment to jot those ideas down? 3 Send a friendly reminder. Emails get lost in busy inboxes. It happens. Your might appreciate a reminder that there’s still an open email chain needing attention. If your inbox is anything like mine, it tends to get unruly fast. Did this thread get buried? I wanted to make sure things were still in progress. Let me know if you need any help. Whether you’re networking or pursuing a sale, when you want to stay on your ’s radar, begin with one of these approaches. If you’re hoping for a specific result, conclude with a CTA that points your at the next step and prompts action. 4 Offer something of value. Even when you’re ultimately trying to get something, it can be helpful to give something useful as a lead-in. Are you still looking for solutions to convert [company] website visitors to subscribers? I read a great article this morning about the power of using quizzes to ease visitors into your sales funnel, and I thought you’d appreciate a link. A quiz plugin like [your app] could be the answer to the conversion problem you mentioned. Do you have a few minutes Tuesday at 2:30 Eastern to chat about it? 5 Reference a blog post they (or their company) published. It’s likely you and your s and sales leads have some common interests. When a or their company posts something relevant to you, that’s a perfect reason to check in. I read your blog post about email funnel strategies yesterday. I liked what you had to say about building trust with new subscribers. That’s the email marketing philosophy we embrace at ABC Consultants, too. It never hurts to mention the connections you and your have in common as long as they’re relevant to the ongoing conversation. I had lunch with Kylie Larson yesterday and your name came up. (All good things!) She said your team is still looking for the right project management tool. I wondered if [software] is still on your radar. I could set you up with a free trial account. Then we could meet for a 15-minute video walk-through so you can see if [software] is the best solution for you. Should I make that happen? 7 Recommend an event you’re attending in their area. There’s no better way to network than going to events, so why not invite your most valuable s to join you? I was making plans to attend the Great Big Event the weekend of July 7th and it occurred to me you might be interested in going. If you decide to register (or you already have), let me know so we can get together for coffee or lunch. I hope to see you there!